When you must stand your ground, do so in strength, but BE NICE! When you must reaffirm your personal boundaries, do so with clarity, but BE NICE! When you are disrespected, turn the other cheek, but BE NICE! When you are physically attacked, defend yourself appropriately, but BE NICE! When it is the right time to express anger, articulate your feelings, but BE NICE! When someone is almost impossible to deal with, use wisdom, but BE NICE! When God doesn’t do what you thought He SHOULD do, cry out to Him, but BE NICE! When you suffer unjustly in body or soul, plead for God’s intervention, but BE NICE! When you are falsely accused, refute the accusations, but BE NICE! When your reputation is cruelly trashed, let your consistency in life set the record straight, but BE NICE! When your anger has been heated by another into a boiling cauldron for revenge, take a deep breath, give the situation to God, allow Him to take care of any and all revenge, and BE NICE! Being NICE is not a sign of weakness, it is evidence of godly fortitude when you maintain your cool where others might explode. Sometimes being NICE in response to a very angry person will calm them enough to become cordial. But even if being NICE doesn’t calm them, BE NICE anyway. Are there times, places, and situations when BEING NICE is not the correct response? Perhaps, but you and I rarely encounter those conditions, so always plan to always BE NICE, especially when your emotions are screaming within your soul. Our ability to experience a variety of emotions is a wonderful blessing from God, but our emotions were not created to lead us in our actions. Our capacity to reason was created to lead us, and we are to give guidance to our emotions just as a good parent provides strong, loving guidance to a very emotional child. So, in all things, always plan to BE NICE! My wife is a real customer service professional. She has managed restaurants, worked for school administrations, worked in churches, and for about fifteen years now has worked for city governments, with great effectiveness serving the citizens with kindness, patience, and sincere engagement. She has been a real role model for me in my own ministry as a pastor. In looking back on the qualities of an effective customer service representative, things like serving with a happy countenance and being emotionally engaged with the customer, it dawned upon me that too many family relationships are missing the benefits and blessings of a simple “customer service professionalism” in their relating with one another. While the use of the term “professionalism” might sound cold or insincere, consider the “cold” and “insincere” words, attitudes, and actions that are making so many families miserable. If they will raise the quality of their family “customer service” to at least that of a professional, it will grant the family breathing room to calm their hearts and to reset or reboot their relationships. Besides, there is nothing cold or insincere about basic kindness and gentle love within family relationships. Which is worse: a physically violent “Road Rage” person, or a verbally abusive and hand gesturing person who detonates another “Road Rager”? Let’s be wise, mature, and gracious when we are driving. 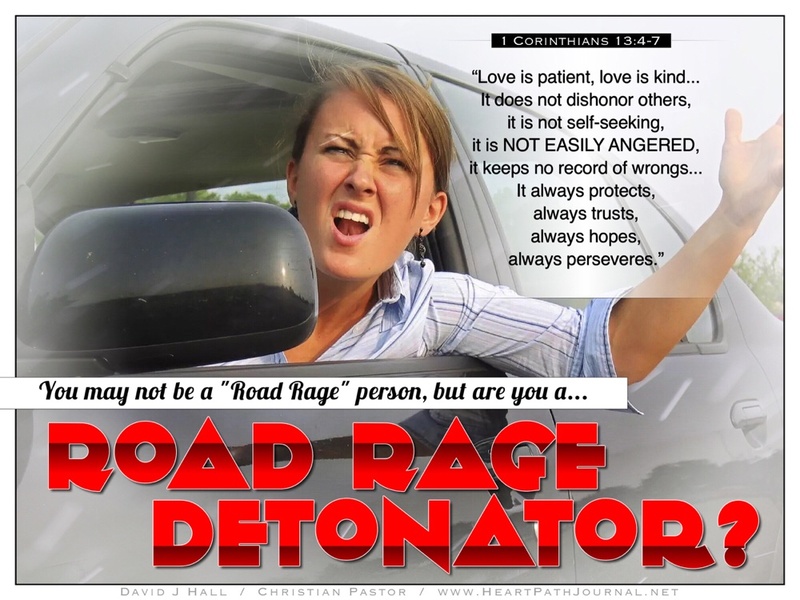 This isn’t out of fear of those whose Road Rage is prone to being physically violent, but instead out of love for Christ and heeding His call for us to be full of love. Both kinds of people, “Road Ragers” and “Road Rage Detonators,” are in desperate need of spending time on their knees in prayer, seeking help from God for their lack of temper control.